You have got to try cables! Is that gorgeous or what?! And that's my practice swatch! I'm telling you, you have to try cables. They are so easy, and you don't need no stinkin' cable needle. :-) I used a dpn. I think you know by now that the fanciest thing I've tried has been socks... this was easier. Much easier. It's so much fun to watch the cables take shape as you keep knitting. 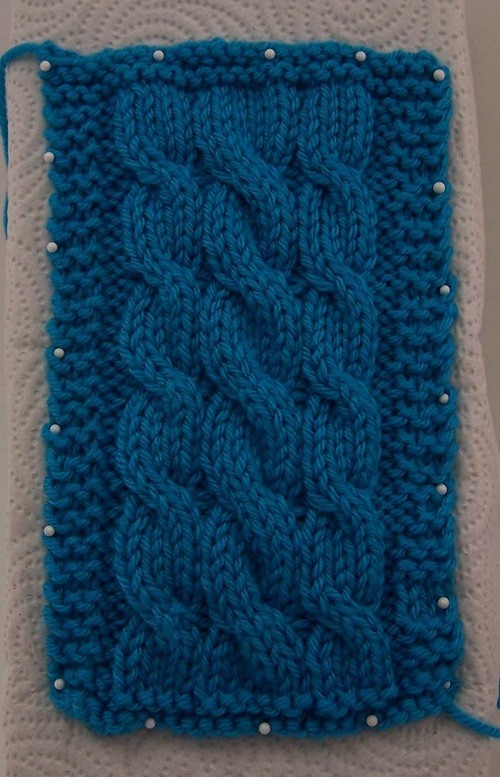 The center cable is a 6-stitch cable and the ones on each side are 4-stitch cables. Something that surprised me (although it shouldn't have) was how tight the knitting got when I crossed the stitches. It makes perfect sense now, though. Because the stitches are being crossed, they're being stretched which tightens things. All my spinning last weekend has left me a tad burned out on turning fiber into yarn. Since I have three knitting projects I'm in the middle of, and of course I'm now obsessed with cables, knitting will pretty much be it for the weekend. Who knows, I might even complete something. Shocker!